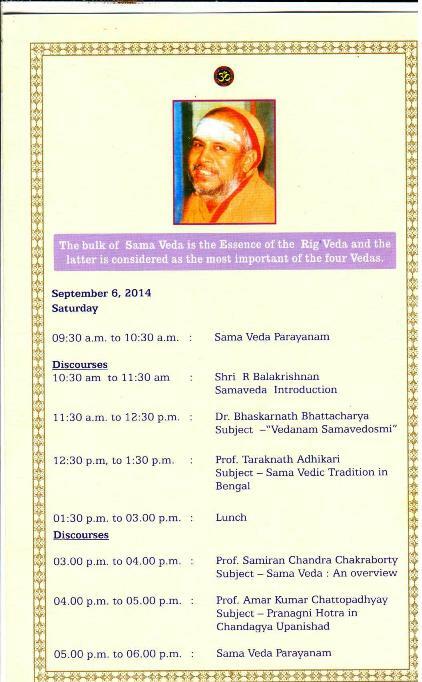 With the benign blessings of Their Holinesses Pujyasri Jayendra Saraswathi Shankaracharya Swamiji and Pujyasri Shankara Vijayendra Saraswathi Shankaracharya Swamiji, Sama Veda Sabha will be held at Ved Bhavan, Kolkata from 5-7 Sep. 2o14. 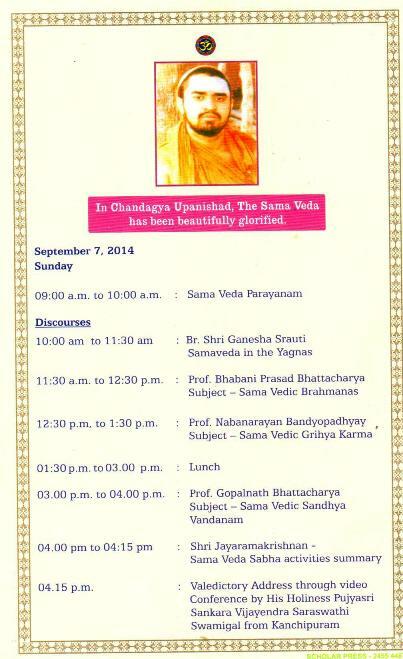 Similar Sama Veda sabhas were held earlier in Kanchipuram, Chennai, Mumbai, Bangalore, Coimbatore and other places. Vedas are the highest source of knowledge. Among the four Vedas, Sama Veda is the most unique as it has the Mantra portion and the Gana ( music) portion as well. This unique nature requires learning of the Veda twice, i.e. in the Mantra form and again in the Gana form. 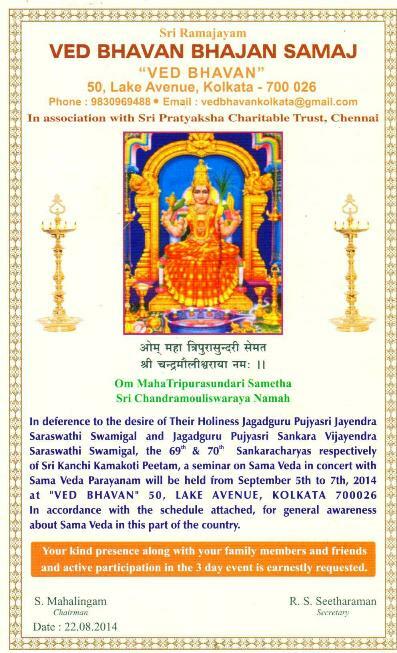 With the intention of encouraging the study and chanting of Sama Veda covering all its aspects available presently and preserving its unique identity, “The Sama Veda Sabha “ was constituted by Their Holiness Shankaracharyas of the Sarvajna Peetam Sri Kanchi Kamakoti Peetam of Kanchipuram. 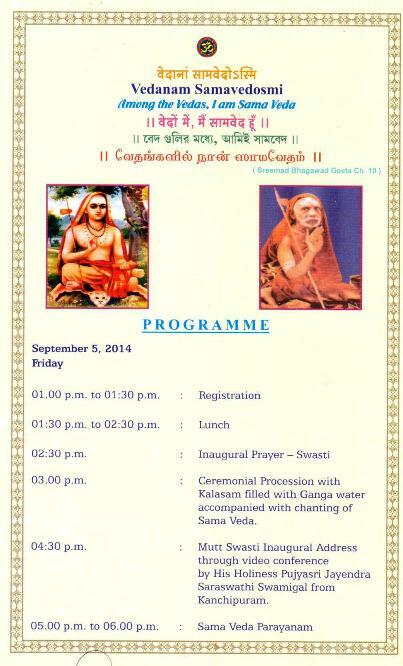 This Sabha was inaugurated on the 25 of November, 2012 ,on the auspicious occasion of Brindavana Dwadasi at Shankaralayam, Chetpet Chennai. This day, it is deemed that payasa dana is performed for invoking divine blessings of Mahavishnu. This day was apt and thus chosen for the Sabha as the Lord in the Bhagavad Geeta states the Samaveda to be Himself”Vedaanaam Samavedosmi”.